In the end, after hours of back and forth between miffed Democrats and Republicans, the GOP had the votes to push through their $23.9 billion budget Friday morning. Members of the state House of Representatives gave their final approval of the spending plan Friday, ushering the budget onto Gov. Roy Cooper’s desk. The Senate approved the privately-negotiated budget Thursday morning. And even if the Democratic governor vetoes the spending package, Republicans have the votes to override Cooper in both chambers. “Pay raises for law enforcement and correctional officers, tens of millions of dollars for classroom protections and prison security, lead state budget investments in public safety passed by the North Carolina House of Representatives today,” House Speaker Tim Moore said on Twitter, shortly after Friday’s 66-44 vote to approve. Republicans touted raises for state employees and teachers, school safety investments, tax cuts and more on the House floor Thursday and Friday, even as feisty Democrats chided the majority party for an unprecedented budget process that controversially cut off all amendments. House Democratic Leader Darren Jackson said residents will remember Republicans’ budget choices, pointing chiefly to lagging education funding under GOP leadership. “North Carolinians are smart,” said Jackson. 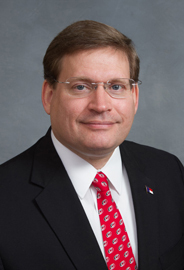 But top Republicans like Rep. Nelson Dollar, a Wake County representative who’s long led the GOP budget-writing in the House, blasted Democrats back, claiming that education funding was already sliding even as Democrats expanded their budget plans before the 2008 recession. “Democrats want to go back to the days of tax and spend,” said Dollar. Democrats did approve furloughs and K-12 cuts in the midst of the 2008 recession, although the state’s education funding, when adjusted for inflation, has declined sharply under Republican leadership too. A report last year from the nonpartisan Center on Budget and Policy Priorities said North Carolina’s drop in per-pupil spending from 2008 through 2015 was among the steepest declines in the nation. 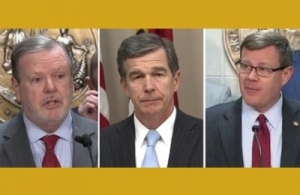 Cooper’s office said the governor would be reviewing the spending plan in the coming days, but a spokesman for Cooper blasted Republicans for their budget. Process wasn’t the only bone of contention. Critics accused Republicans of under-investing in public schools, short-changing Medicaid, snubbing the state’s environmental regulators and loading their plan down with election-year pork provisions.